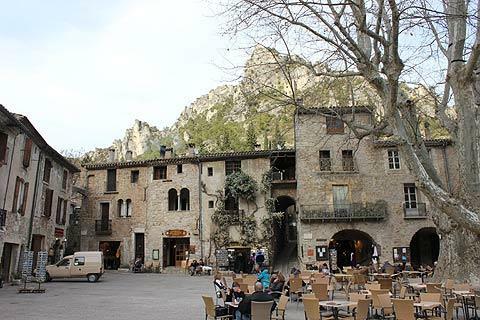 Saint Guilhem le Desert, one of the 'most beautiful villages of France', is found 20 km east of Lodève and north-west of Montpellier in the Languedoc-Roussillon region. In the Gellone Valley, it is in a beautiful and remote location, surrounded by the wild and rugged countryside of the Herault Gorges, with steep slopes and cliffs poised high over the village. As early as the 9th century an abbey was established here in this remote location, which held a fragment of the true cross. 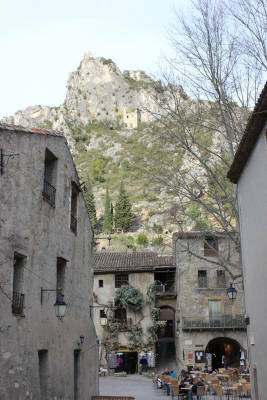 As a result in the early middle ages Saint-Guilhem-le-Desert was an important stopping point for pilgrims, and the village developed around the abbey. 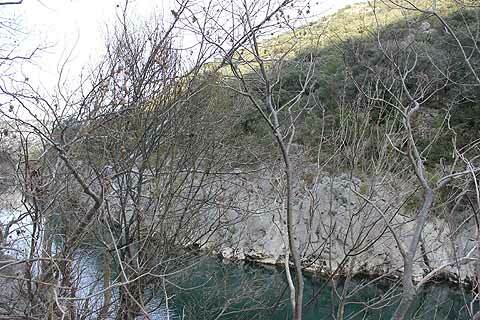 The approach to Saint-Guilhem-le-Desert is fabulous as the approach road is along the beautiful Gorge de Herault. 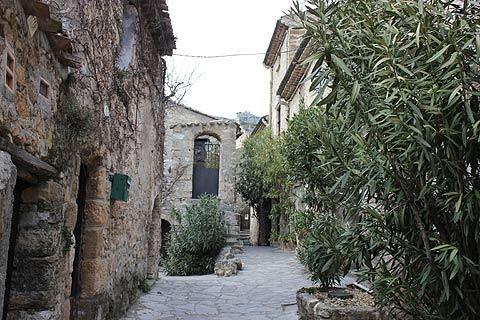 Enter the village by the Church of Saint-Laurent, now the tourist office in St Guilhem le Desert. 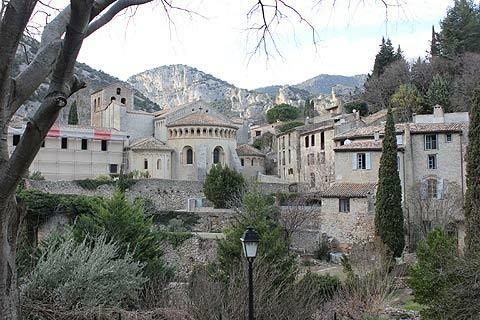 More than a thousand years old, the village is situated attractively along the valley bottom, just one street more or less - but it is a long street, leading to the Place de la Liberté just near the abbey. There is parking up near the Place de la Liberté if you do not have time to walk along from the Gorge. There are numerous traditional stone houses and buildings in the village, many now carefully restored, and other architectural highlights. Among the highlights are the Maison Lorimi and the Maison Sandonato, with their facades containing numerous stone arches. 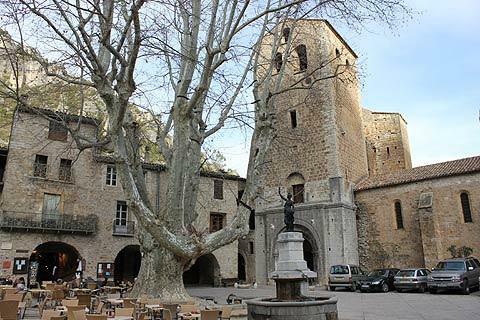 Also in the middle of the village is the 12th century Tour des Prisons. This along with the Chateau du Geant in the hills above the village were vital parts of the village fortifications. The village 'centre' if one can be said to exist, is the part of the town around the abbey and the Place de la Liberte. The Place de la Liberte is a quiet square surounded by ancient houses and dominated by a plane tree, said to be more than 160 years old. You will find a cafe and several small shops in the square. It is a charming place to sit and soak up the peaceful atmosphere. 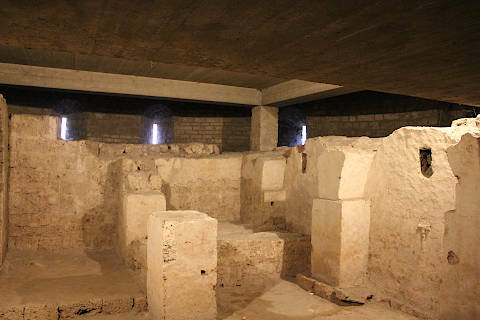 A small part of the fortifications that once protected Saint-Guilhem-le-Desert can also be seen. There are also a couple of 're-creation' type museums with characters set in rooms typical of bygone days. 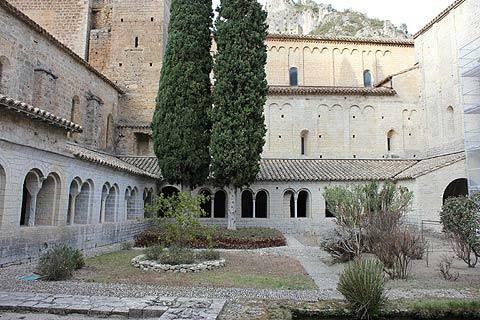 Apart from the village itself, the Gellone Abbey is the main highlight of a visit to Saint-Guilhem-le-Desert. The abbey church is a completely perfect Roman church that simply belongs in its setting, sitting serene and graceful below the towering rocks and dating in part from the 12th century. The Abbey has a lovely cloister with an attractive garden in the centre. 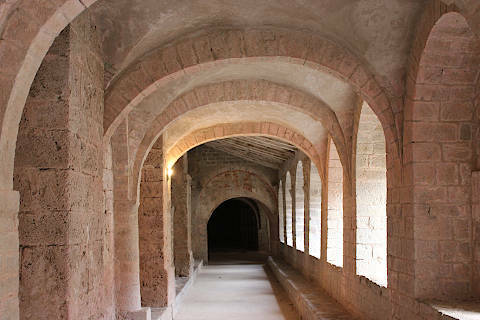 Although this is largely a reconstruction as a large part of the original cloisters has been dismantled and reconstructed in a New York Museum. Inside the abbey church there is a highly regarded example of an 18th century organ by Jean-Pierre Cavaillé, and a small museum containing various artefacts from the site. 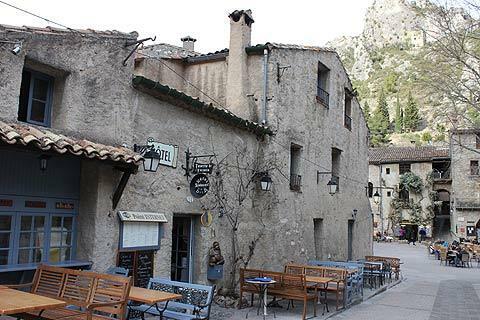 The village is now listed as one of a very select number of 'Grand Sites of France' and it is a UNESCO World Heritage Site as part of the route of the Camino de Saint Jacques pilgrimage. 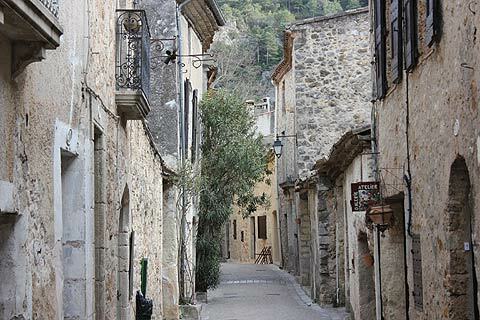 Rising up above Saint-Guilhem-le-Desert are beautiful hills which are excellent for walking. 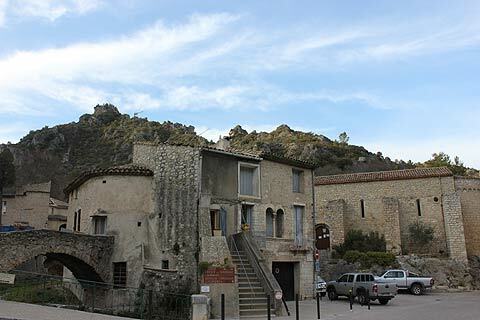 Sat above the village is the 'Chateau du Geant' which makes a popular short walk for visitors. Further away is the 'Cirque du bout du monde'. And of course the Saint Jacques pilgrimage route passes through the village. 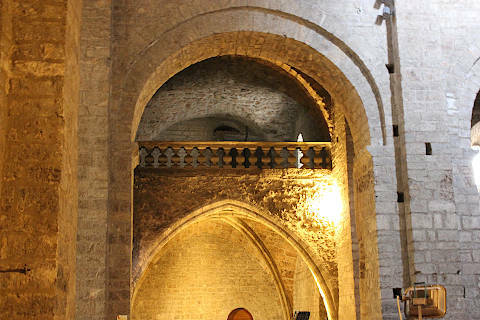 There is a cave near St Guilhem le Desert - the Clamouse Caves - that is well worth a visit, with its spectacular 'cathedral room'. See also the Pont du Diable (an old bridge) in a very pretty setting straddling the gorge as you approach the village from the Herault Gorges - the river beach below the bridge is popular with bathers. Also on the approach you will see the towers and mill at Plancameil.